Hey Dolls! Happy Sunday! I don’t know about “your neck of the woods,” but it is unseasonably warm on the East Coast. High 60’s yesterday and we are expecting the same today. I’m loving it; but know that it won’t last. Nevertheless, my mind drifted to a summer cocktail. Something befitting the warm-ish weather. Peep the mixology below for the Cucumber-Mint Sparkler. The Mixology. First, you’ll need to make the simple syrup. In a small saucepan, bring the sugar, water and mint leaves to a boil. Reduce the heat and simmer, swirling the saucepan occasionally, until the sugar dissolves, 1-2 minutes. Remove from the heat and cool completely before using. In a cocktail shaker, muddle the chopped cucumber with the lime juice. Add the vodka, simple syrup and a few ice cubes, and shake vigorously until the outside of the shaker becomes frosty. Strain into a glass filled with ice (I like crushed ice for this), and top with Prosecco. Garnish with the cucumber slice, mint prig and enjoy! Salut! Hi Dolls! Happy Super Bowl Sunday! Today is an unofficial national holiday for sports fans. I hope everyone has plans for a fun-filled evening watching the big game, halftime show and commercials. Today’s Champagne Sunday doesn’t have a sports theme, but you can certainly serve this cocktail to your guests while they cheer on the Altanta Falcons or New England Patriots. 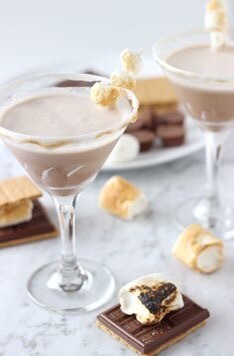 Peet the deets below for the S’mores Martini. By the way, leave a comment and let me know who you a cheering for today – Matty Ice” and the Falcons or Tom Brady and the Patriots? The Mixology. Coat the rim of a martini glass with marshmallow fluff, dip into crushed graham crackers then lightly toast the rim using a kitchen torch. In a cocktail mixer, combine all the ingredients with some ice cubes. Shake well until frothy. Strain cocktail into prepared glass. Garnish with three toasted marshmallows on a skewer. Serve and enjoy! What will you be sipping during the Super Bowl?